Parking: Reserving parking is the responsibility of the client unless otherwise stated in your estimate the crew will need about 3 regular parking spaces in front of the your property for their truck and chipper and will need any trees to be worked on to be free of cars beneath them. If work is being done in the backyard you will also need to move your cars from the driveway as debris can damage them on the way out to the truck. Personal Property: Any pots, outdoor furniture, or other personnel items that can be damaged must be moved from the area in which the work will take place. If you have questions about what to move please call us, as the crew’s time removing personal items is an extra that can result in additional charges. Dog Poo: Your yard must be free of dog poo when the crew arrives as they will be running ropes and rigging gear on the ground and when those items are contaminated it can cause delays and in extreme cases even cancellations of work. The crew is willing to pick up one or two piles you may have missed but anything in excess of that is your responsibility. Internet Access: When having tree a removed there can sometimes be interruptions to your internet, cable TV service, or land line phone service. Most of the time you can call your cable company and have service restored right after the tree work is completed or the next day, but if you have the need for uninterrupted cable/internet service we can provide a temporary fix to allow you to have service until your cable company can come out. This extra is provided free as long as you return our cable line either by dropping it off or mailing it in, otherwise the cost is $40. Arrival: If your tree work is scheduled as a morning arrival the crew will arrive between 8:30-9:30am, if you are scheduled for any other arrival time the crew can arrive up to 3 hours before or after your scheduled time of arrival. If you would like a more exact ETA you can call the office within an hour of the scheduled arrival and we will do our best to provide an update. If you have special concerns such as you are leaving work at noon and the crew should not arrive before then or you are taking a day off of work to be there when the work is done you should share these with your project manager as the schedule can change due to many circumstances and the more he/she knows the better they can accommodate your situation. Timing of Different Services: Not all of our services are done by the same crew. For example if you are having a tree removed a crew will come to remove the tree, another crew will come to remove the firewood, yet another to grind the stump, and another to plant a new tree. These services will be preformed over a period of several days (2-5 days). If you have specific deadline that you need to meet in your scheduling please share that information with your project manager. We are required by call before you dig laws to wait 48 hours after a tree removal before stump grinding unless other arrangements are made ahead of time. Being Home: It is not necessary for you to be home when your tree work is being done. 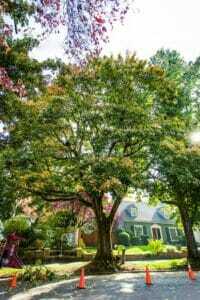 One way to significantly reduce the cost of getting tree work done is to be able to work while it is being done and to trust it will be done right in your absence. But if you have very specific ideas about how far a certain tree should be lifted or how far back you want some tree pruned or other items like that where the work may require your personal insight it is better if you are home in those cases. Leaves: If you are having tree work done in the fall and you would like us to clean up leaves and other debris already on the ground we charge an extra fee for that called a Fall Clean up. Firewood: If you plan to keep the wood off of your project be aware that wood is left where it lays in 16”-18” lengths. If you need another length or the wood moved and staked you will need to have your estimator add that to your project as changes after the fact can result in additional charges. Stump Grindings: When having a stump ground a mound of wood shavings mixed with dirt will be left behind. If you are having a large stump removed it can be a large mound. These grindings need to be removed prior to planting in that area or to decompose for at least one rainy season, either way there will be excess material that needs to be moved. The grindings make great mulch in your planting beds. Also, we can remove those grindings for you for an additional fee at your request. Completed Work: When the work is complete your yard should just as good as or better than before we came if it is anything other than that or you are anything other than 100% satisfied please give us a call we would like nothing more than to make it right. If you have any questions about the work that was done an arborist in our office can answer those for you at your request. Also if you have any feedback at all about how your service was delivered that could help us do a better job we would love to know about it.